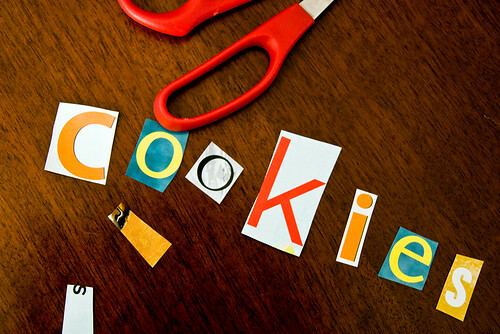 Sending baked cookies in the mail is a super sweet gesture, so long as they arrive on time, and in one piece! A cookie jar mix, however, means that your recipient will be enjoying oven-fresh cookies at their leisure, all the while thinking about how awesome you are. But sometimes cookie jar mixes can be too rooster, denim and gingham. What about a mix for those of us who only wear black and couldn’t tie a perfect bow to save our lives? Enter the punk rock cookie jar mix! With cut-out ransom letters as the label, and a safety pin holding together the ribbon, you don’t need to be too precise with the design. And the whole thing comes together in about half an hour, making it a great last minute gift. I sent these Double Chocolate Pecan cookies to my friend Anna Dorfman, because she built and designed such a lovely site for the Teal Cat Project. 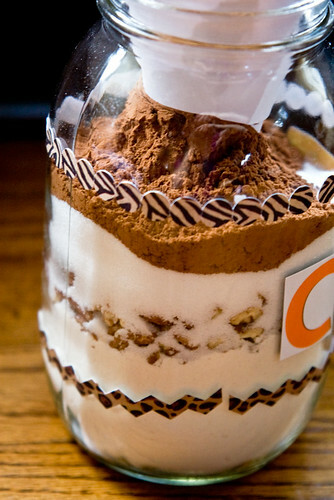 2) Wrap jar one inch from the bottom and 2 inches from the top with the animal print stickers. You can make your own strips with some printed paper and a glue stick. 4) Place the “K” first. Because it’s the middle letter it will give you more control in where the other letters are going. Use a glue stick to completely coat the backs of the cut out letters, and stick them firmly in place. Rub them to make sure they stay put. 5) Time to fill the jar! 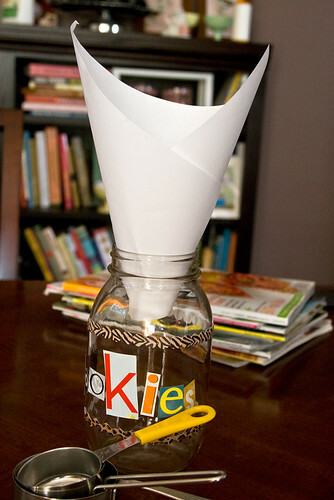 Make a funnel out of paper to get your ingredients in without making a mess. Just roll a sheet of paper into a cone and snip off the bottom. 6) Add the flour first, along with the baking soda, salt and flax. Then add the pecans, and use a spoon to smush them into the sides so that they show through. Add the sugar, then chocolate, then the chocolate chips. Seal jar tightly. 7) Make the card. Use an old card or stock paper with a pretty print and a blank side. I used the May image from the My Zoetrope calendar. Make a rectangle big enough to fit the text. Fold it in half and punch a hole in the upper left side. 9) Slide the ribbon into the hole you punched and make sure it’s secure. Wrap ribbon around the lid and affix with a safety pin. The card should be dangling a few inches. 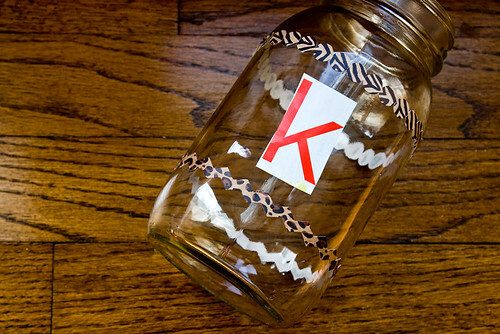 10) Stick a few silver stud stickers on the jar letters, and the card. Voila! Your punk rock cookie gift jar is finished. Makes sure to pad it really well if you’re mailing it. Perhaps throw in an oven mitt? Thank you so much for this! I will definitely be making these come Christmas time! I’m going to make these for Christmas! What a great idea. OMG how creative is this! What a great bday gift idea 🙂 Love it! Perfect! And much better for holidays, I think, than those weird cookie swaps. I love this! Will def save this idea for Christmas! These look fantastic! Super easy & fun to make/receive. Thank you. Thank you for catching that! It’s 3/4 cup, I will update the post. Mmmm!! Excited to try this! Can it be used with other recipes from VCTOYCJ? Probably, so long as the quantities look similar. You don’t want an underfilled jar, or a jar where all the ingredients don’t fit. If I were to give this to an omnivore who doesn’t usually have any non-dairy milk around, and I don’t want to encourage the use of dairy milk for obvious reasons, do you think it would work if I added soy milk powder to the mix and replaced the soy milk with water on the recipe card? Just wondering…. I’d say instead to supply a little sip box of vegan milk. I looked a few times, but how much sugar is there to put into the jar? Ugh, sorry… Forget my post, too. I can’t get over how adorable these are!!! I am already thinking of making them for housewarming gifts. Hey the small vegan milk container was a genius idea! 🙂 I made the cookies for me and my husband last night and they were delicious! Thanks, Isa! Totally going to send these to my cousin at college! She has a kitchen for the first time and is very excited to use it, though doesn’t know how to make anything, so this will be perfect 🙂 Thanks a million for the great idea! I also love the idea to send an oven mit, and ALSO love the idea to send a sippy container of soy milk! I was worried she’d use dairy milk too 🙂 I think Whole Foods sells small containers of soy so I could include one in the package. Thanks, Isa!! another thing to use for the recipe card, pages from a page-a-day calendar. Especially if it’s a thank you gift and you use the date they did the something nice! I love it and am totally giving these out this holiday season, in an oven mitt, with a mini container of soy or almond milk. Thanks Isa! How fun will this be? Love it! Thanks! This would be a super cool item to offer in the Vegan Van for holidays. Would it be okay with you if I used this idea (but with my own recipes, obvs)? So awesome to see you at Vida Vegan Con! That is too cool. I am sOO making these as gifts! wow! Oh thank god, I wanted to do this at Christmas last year but thought it would be all screwed up if you didn’t soak the flax and so on etc. Thanks for the awesomeness Isa! You are so cute I could effing puke. And pretty much everyone I know is getting this for every gift I ever have to give them pretty much forever. Love this! I need to do this for my friends. This has nothing to do with this post but I didn’t want to look for an old one that had what I was asking about in it. I was looking at some of your cookbooks (Veganomicon and Vegan with a Vengeance I think) and noticied you say to use cooking wine a couple times. My sister who is a cooking genius and whom I would trust with my cooking-life (figuratively speaking) says that cooking wine is horrible and a waste of money and you shouldn’t use it. Is there some vegan-y reason to use it? So awesome! Making some of these for friends and family will make my day! wow! this is great! 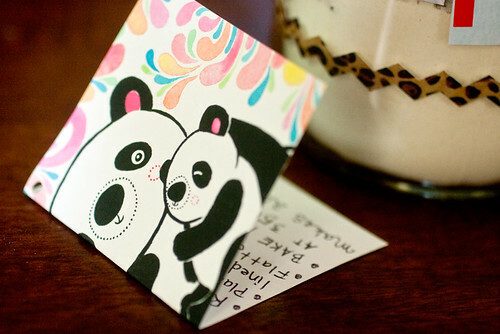 i’m going to make it for my penpals when they have a birthday! Fantastic! I’ve also been decorating my glass jars lately. I just tried the recipe. Mother Love. They are indeed A-mazing! I will certainly be jarring up this cooking mix for Xmas gifts…and any other special occasion or holiday that merits a gift. This is so cool. Guess what everyone will be getting from me for any upcoming holiday. Wow. What an awesome idea. I made these for a friend of mine, but now I’m thinking of more friends and family I want to make these for! 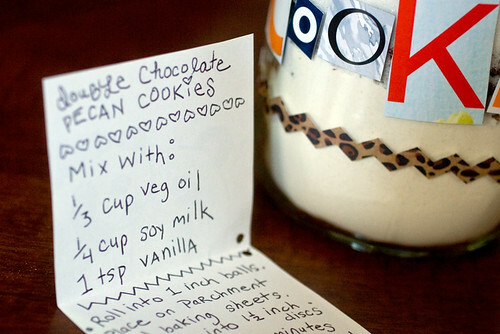 I love this concept, I wish someone would give me a recipe in a jar! This is great!!! Do you happen to have any other vegan recipe’s in a jar? I’ve been out of work for the last 5 months and plan to be out longer, due to an injury and surgery, so I don’t have much money for christmas gifts, but these seem perfect!!! If you have any ideas, PLEASE let me know, I would LOVE them!!! I don’t, but any recipe that looks like it makes the same amount would work. Um WOW, I am gonna be all over this like…well, me, on cookies. I’m going to try this with the cherry almond cookies from vegan cookies invade your cookie jar for my mom’s birthday, and see how she makes out with it. And if she asks me if it’ll work with dairy milk I’m going to say no, it wont. ha. I was just remembering this kind of thing from a newspaper story a million years ago. Thank you for reading my mind. Okay, now I know what I’m giving as holiday presents 🙂 probably including to myself. This looks amazing, thank you! I have included the idea in a much simpler and cheaper way on my blog, but of course also linked back to your page (twice actually). I hope that is okay with you, otherwise let me know. Direct link to my budget-version: http://vintagevegan.net/keeping-up-appearances/gift-ideas/gift-idea-cookie-mix/ (almost embarrassed, know that I look at your cool jar). Isa Chandra, I want to tell you that I recently bought Veganomicon, and I am love with this book. I’ve been making 2-3 recipes out of it each week and am completely satisfied each and every time. It’s changing the way I eat for the better. just made some of these jars over the weekend. I LOVED the idea! I have never heard of these! I did modify a little and made Halloween Jars instead. Followed the recipe minus the pecans (we have some allergies that run in the family) and the cookies were absolutely delicious. they were so simple, and baked beautifully. THANK YOU! You are my favorite person ever. I love your site and always visit time & again for great recipes and inspiration. Thank you! Ever? There are a lot of people in this world so thank you! I love this idea! I received one of these for the holidays two years ago and thought it was such an awesome idea. Definitely make sure you know of any food allergies the gift receiver might have to be sure they can eat the cookie mix you are sending. Thanks for the inspiration PPK!! MoFo #21: Vegan Yarn Swap! « Hot vegan chick…..peas! These look great and I’m definitely planning on making a bunch of these for the holidays. This might be a stupid question though – what size are the mason jars? Quart? Pint? Thanks! i have a LOT of coworkers i’d like to recognize this holiday season…thus 2 dozen mason jars and craft supplies. thanks for sharing such a fun idea! then they’ll have pie. pie in the sky pie. oh my!! I run a baking stall at our local market and do only vegan stuff, though I dont explicitly advertise it as vegan, as many people here still think “vegan” means “something must be missing.” So, if I don’t make explicit that things are vegan, people see the great cookies and buy them and don’t even think about it/realize it. I want to make these jar mixes to sell at our local Christmas market….but I really only want to encourage vegan baking, and if I put soy milk on the label, it may discourage some people…but I refuse to just put “milk” on the label…so i was thinking about using soy milk powder or coconut flour in the mix itself as a substitute, then i could just put water on the label to add, rather than soy milk…. anyone have any ideas if/how this would work and what amounts might be good to try? thanks much! I made these yesterday and they were very tasty! My vegan son was so happy that he could eat them. what an awesome secret santa idea! who wouldn’t love this?! It’s soda! I updated, thanks for the catch. My first vegan cookies turned out great! better than dairy ones! I just became vegan and your website is really helpful for me..
Just a question,is it possible to buy your books in switzerland? Just spent my night making 3 of these. They are beautiful, thanks Isa! I just found this recipe about two months ago, and it is awesome!! It has very quickly become a favorite in my house. I thought I should share this very awesome vegan cookie recipe with some of our non-vegan family for the holidays. However, I can’t seem to find the right size jar. I have 3 1/2 cup ball jars, but there is too much room left. Does anyone have any other jar suggestions? Someone sent me this as a housewarming gift, and it was great! These vegan cookies are so delicious!! Could Chia seed be substituted for the flax? How long do you think these jars are good for? I mean, how long would their “shelf life” be, you think? I probably wouldn’t let them sit for any more than 2 months, and that might be pushing it. Love this idea! 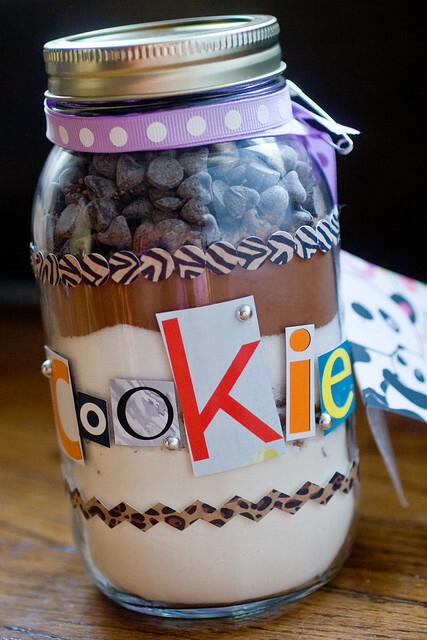 This inspired me to make vegan cookie mix jars for my omni sisters for Christmas and they were a huge hit! I think I may have started a new holiday tradition. what an awseome gift!!!! I cant wait to make these!!! Absolutely delish! I tried out a test batch of these cookies before I start giving them out as gifts. This is now my go to cookie gift jar!!! 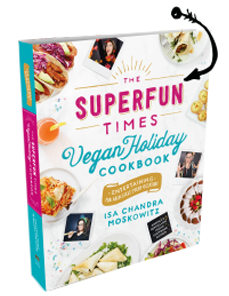 I just got sent a book, Vegan Freak, and got excited when I saw “Foreword by Isa Chandra Moskowitz”!! It reminded me about your blog and I’m back and reading again. So when I thought I’d search for Christmas recipes on here, I was so glad when I found this!! I am DEFINITELY going to make these for people this year!! I do have one question though – would coconut sugar work?? Any recipes that don’t require “veg” ingredients? If I give this out, no one would go buy soy milk, and just use regular milk, defeating the purpose. I want something fool proof that where the only ingredients to add can only be vegan! 1/4 cup water would work! Hi, I just made these. They are my first attempt at cookie jar mixes (we don’t really have them in the UK) and they look great. But the jars are only about 3/4 full when complete – perhaps due to a different jar size or cup size difference between US and UK. Any ideas what I can top them up with so they still look good and don’t spoil the recipe? Thanks! I just made these to test out before giving them away. Wow. These are amazingly delicious and easy! 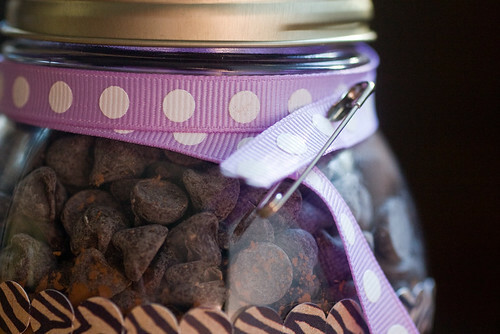 I will probably make them all the time now without the jar! Thank you! This recipe is perfect! I’ve tried this twice, and the mix doesn’t quite fill up my quart jars. There’s maybe an inch and a half of space at the top. What am I doing wrong?!? What size jars have other people used? I tried clear bags, but that just wasn’t as pretty. Do you have to use soy milk? I made these for holiday gifts this year, and they came out really cute! Since the ingredients didn’t quite fill up my jars all the way, I took another commenter’s suggestion and filled up the remaining empty space with crumpled up tissue paper. It looked really seasonal and helped keep the ingredients in place. I also made this recipe for myself with water instead of soy milk, and it turned out great. The fisrt time was a disaster after 5 times i had an excellent result i am so happy!